Brrr…it’s cold outside! How do frogs and toads survive? Last week, as I was taking in the beauty of the snow-covered New England landscape, I started thinking about amphibians. With more than a foot of fresh snow covering the ground, I began to wonder where all of the frogs and toads go in the winter. We received so much snow from this recent snowstorm that I had to shovel a small path so our Boston terrier could navigate the backyard. If he needed help getting through the snow, how was a small frog or toad going to navigate the cold, wintry earth? Well, it turns out that frogs and toads, particularly in the Northeast and other colder climates, spend their winters quietly tucked away while they hibernate in the mud at the bottom of lakes, carefully concealed in logs and tucked under leaf litter. Some toads even bury themselves to hibernate. Others continue to swim all winter long. Green frog and bullfrog tadpoles hatch in the summer and then spend all winter living and swimming below the ice in the nearly freezing water. But none of these species compare to the wood frog when it comes to cold weather adaptations. This hearty frog is one of the more cold-adapted species with a natural habitat range extending farther north than any other amphibian species. In fact, the wood frog is the only frog found north of the Arctic Circle. These frogs hibernate during the winter in terrestrial or forested wetlands in very shallow earth. What’s most amazing is that the wood frog is so adapted to cold temperatures that its tissue can actually freeze and thaw. Throughout the winter, wood frogs stop breathing, their hearts stop beating, and ice crystals form within their hibernating bodies, according to the Minnesota Department of Natural Resources. A special antifreeze they produce keeps liquids from freezing inside their cells and killing them. When spring arrives and the temperature rises, the frogs “thaw” and they emerge from hibernation. The strategic advantage to this adaptation for the wood frog is that they are the first frogs out in the early spring, while other frogs are still hibernating deeper below. They are the first ones heard singing (the noise sounds like a chorus of “quacks”) and they begin breeding once they emerge. 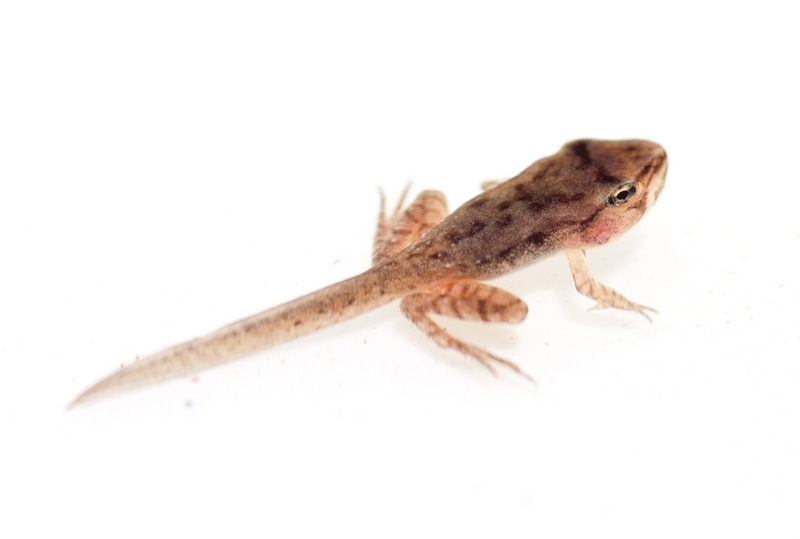 By late April, thousands of tiny black wood frog tadpoles can be found in vernal pools. Tadpoles develop quickly in order to metamorphose to froglets before the vernal pool waters dry up by late summer. So, the next time you see a snowy landscape, take a moment to think about frogs and toads and their amazing cold weather adaptations. It’s incredible to think that just beneath the smooth sheet of glistening ice covering a pond that small tadpoles could be swimming through the freezing waters, or that a small toad or frog could be snugly nestled within a hollowed log deep in a winter slumber. This entry was posted in biodiversity, why frogs matter and tagged Lithobates sylvaticus, Throughout the winter, wood frog, Zoo New England by Lindsay. Bookmark the permalink.